Tai Peleg of BioWare has announced on his Twitter today that Anthem development has ended, and the game has gone gold. This means that for all intents and purposes the game is on track to release on February 22 for the Xbox One, Playstation 4, and PC after years of development. 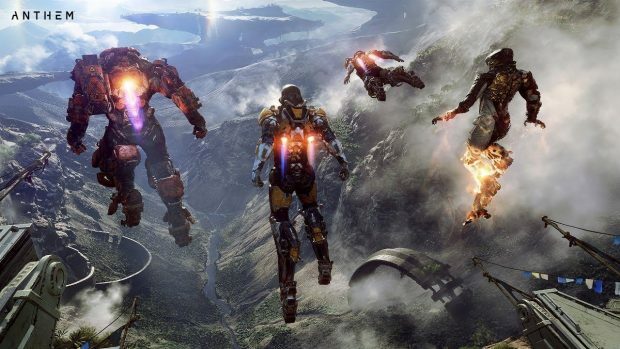 Anthem is the first BioWare game to come out since Mass Effect: Andromeda back in 2017, and that game had a rather divisive reaction among BioWare’s fanbase, especially considering it was a Mass Effect game. Anthem, therefore, represents an opportunity by BioWare to get back into the good graces of its fandom, but it still has a ways to go. Anthem development was first announced at E3 2016 when it received its first gameplay footage and trailer. Since then a number of different trailers and gameplay clips have appeared, showing off the game’s various Javelin types, a number of gameplay missions, and a story trailer, which was revealed at 2018’s Game Awards. However, Anthem, and especially EA, is casting its shadow over BioWare’s usually impeccable work. A combination of controversy over microtransactions, the possibility of the game having a very rocky start like Destiny, and the possible threat of BioWare being closed if Anthem fails, has caused people to approach the game very cautiously. While Anthem does look promising from its gameplay, we only have a little while in the beta to see what it actually will play and feel like, and even then that’s going to be an old build. What will be happening when the game actually releases in another month is another story. However, even with Destiny and The Division providing Anthem with challenge in terms of wide-open looter shooters, hopefully BioWare’s track record will work in its favor and it will be able to produce a great game. Either way, Anthem development has now ended, and you’ll be able to buy the full product on the Xbox One, Playstation 4, and PC on February 22.